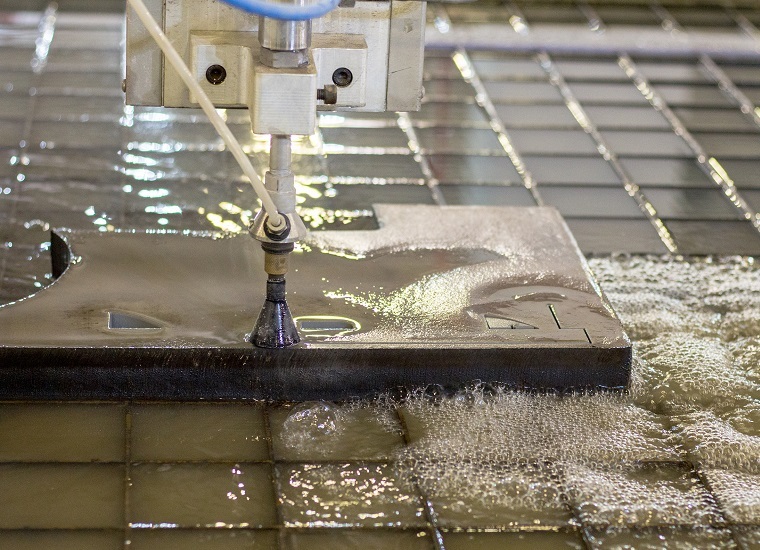 Waterjet cutting is a process that produces shapes by cutting sheet material using a thin, high pressure stream of water containing abrasive particles. 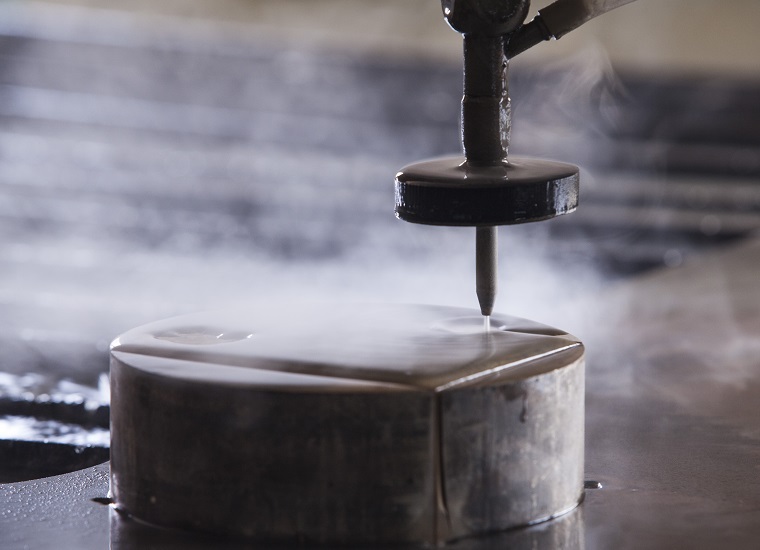 The water jet is at very high pressure – typically 50,000 to 60,000 PSI and mixed with garnet abrasive. The sheet being cut is often submerged in a tank of water to reduce the resulting noise. The high pressure is created by a special pump designed for the purpose. The inlet water for a pure waterjet is pressurized between 20,000 and 60,000 Pounds Per Square Inch (PSI) (1300 to 6200 bar). This is forced through a tiny hole in the jewel, which is typically 0.007″ to 0.020″ in diameter (0.18 to 0.4 mm). This creates a very high-velocity, very thin beam of water (which is why some people refer to waterjets as “water lasers”) traveling as close to the speed of sound (about 600 mph or 960 km/hr). With an abrasivejet the thin stream of water leaves the jewel but abrasive is added to the the stream and mixed. 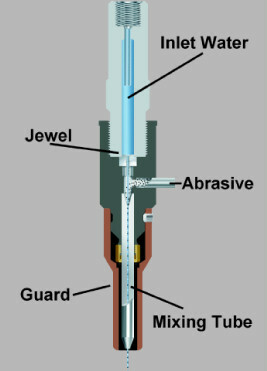 The high-velocity water exits the jewel creating a vacuum which pulls abrasive from the abrasive line, which then mixes with the water in the mixing tube. The beam of water accelerates abrasive particles to speeds fast enough to cut through much harder materials. 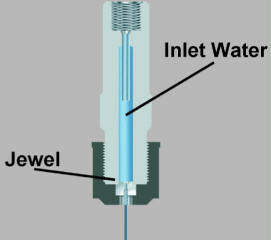 The cutter is commonly connected to a high-pressure water pump where the water is then ejected from the nozzle, cutting through the material by spraying it with the jet of high-speed water. Additives in the form of suspended grit or other abrasives, such as garnet and aluminium oxide, can assist in this process. 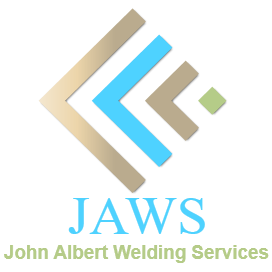 Water jets are capable of attaining accuracy down to 0.005 inches (0.13 mm) and repeatability down to 0.001 inches (0.025 mm). Water jet cutters are also capable of producing intricate cuts in material. 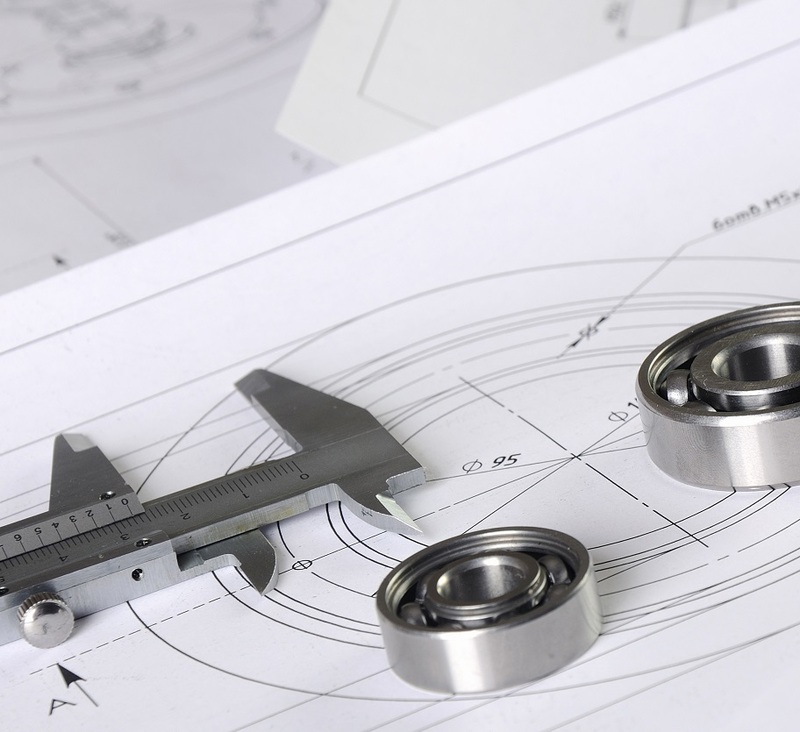 With specialized software and 3-D machining heads, complex shapes can be produced. 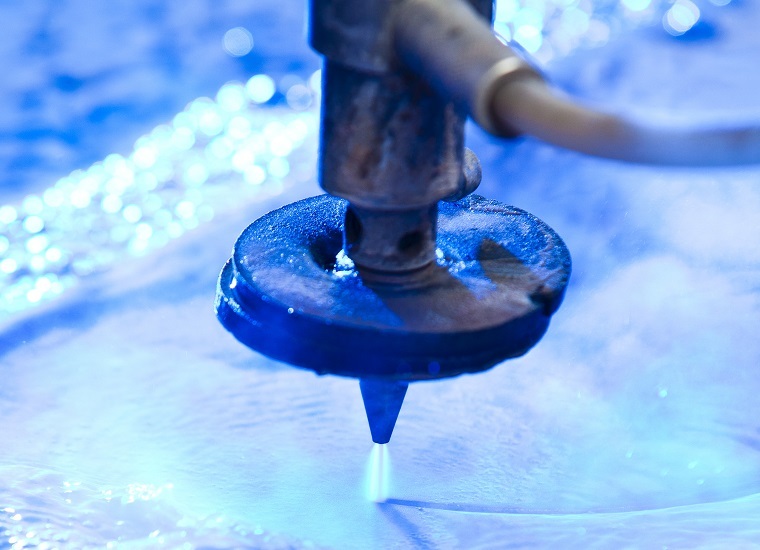 An important benefit of the water jet is the ability to cut material without interfering with its inherent structure, as there is no heat-affected zone (HAZ). Minimizing the effects of heat allows metals to be cut without harming or changing intrinsic properties.